An enough list outlines what is enough in your life so that you can focus on what is important and determine what is excess. It can be applied to every area of your life; from business to family, your health to your home. Enough lists cause you to ask yourself, what is “enough” in this area of my life? What is it that I'm called to do in this area of my life? When it comes to being a wife, what is it that I'm called to do here? When it comes to running my business, what am I really called to do here? Basically, these lists are a list of things that are the bare minimum. And as you focus on the “enough” in your life, you begin to see what is overwhelming you. Having my “enough list” has totally changed my life and empowered me to make solid decisions and I hope you find the same empowerment as you create your own enough lists! What an enough list is. How enough lists bring clarity to her life (and they can do the same for yours). What areas of her life she uses enough lists for. How you can create your own enough list. Do you want to create your own enough list? I have created this FREE download to walk you through creating these lists in your own life. 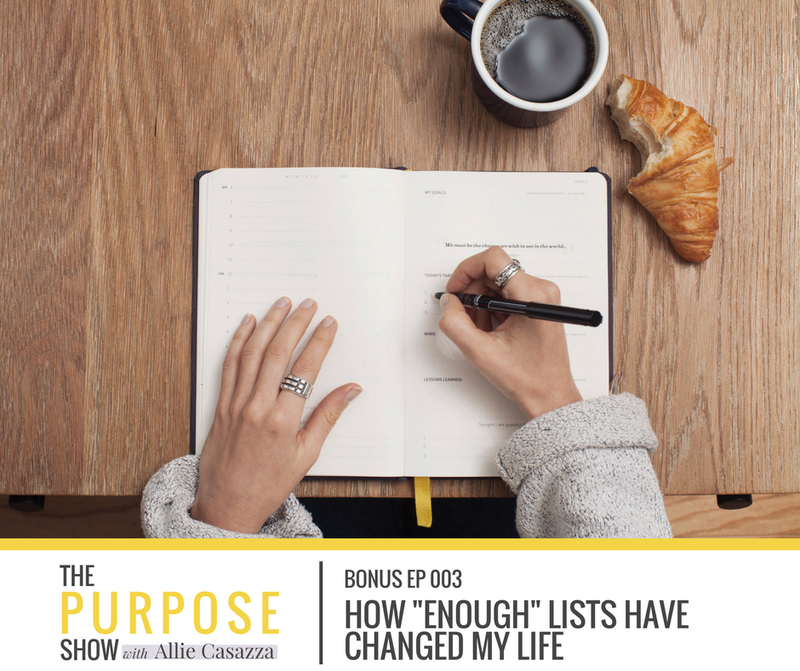 It will help you breakdown the areas of your life that you need to create enough lists for as well as help you determine what is enough for that area. I also share some encouraging statements and things that you can include in your “enough list” to look at when you're feeling like you need to! Hey guys! I am super stoked for this bonus episode. I just couldn't wait to get this content out to you guys. I’m really excited! I really feel like this is going to help a lot of you. This is something that I have done myself for a while. The other day I was looking at these lists that I have and had this light bulb moment, “Hello? Why haven't I ever talked about this on the podcast? Or ever shared that I do this? It’s one of those things that I made up for myself. It is a part of my life and I don't really think twice about it. And it was another reminder for me, “OK, I've got to get this out.” Then I looked at my editorial calendar. If I went along the normal flow of episodes, this wouldn't have come out until summer. I wanted to get it out to you right away. First of all, what is an “enough list”? It's a little, very short list in my phone. I use my Notes APP on my iphone. I have one for all the different areas of my life. For running my business. Being a mom. Being a wife. For running my house, my health, fitness and wellness. I have an “enough list” for every area of my life. Well, maybe not every single little area but, all the main parts of my life. Basically, these lists are a list of things that are the bare minimum. What is “enough” in this area of my life? What is it that I'm called to do in this area of my life?When it comes to being a wife, what is it that I'm called to do here? When it comes to running my business, what am I really called to do here? I'm called to serve my fellow women by providing great content through my podcast and my courses and to change your life completely through that content, if you're willing to do the work. I am called to pray for you guys, not to fix all your problems. It's like a list of helpful reminders. Why am I feeling overwhelmed? If I'm doing only the things that are on these “enough lists” in these areas of my life, I shouldn't be overwhelmed. But I am overwhelmed. Why am I overwhelmed? What am I doing that's outside of this list? What can I cut back on? For business, maybe I've been taking a lot of speaking engagements that take me away from my family and outside of the house. It's really weighing on me, so I'm not going to do those anymore for a while. Maybe it's that I'm trying to go above and beyond with homeschooling the kids. Trying to do all this extra stuff, provide them with all of these social experiences and other things that are outside of the “enough list” for homeschooling. And it's making me stretched way too thin and it's too much. I can look at the “enough list” and be pulled back to reality. I can re-ground myself and say, “OK, this is what is “enough” in my life. What am I doing outside of this? It's too much. Something's got to go.” It's really a way for me to practice minimalism in my life. Here’s a couple of examples. I actually shared this on the Kat Lee podcast. Have you heard that yet? I don’t know when it is coming out. It might be repetitive, but it is a great example. I am a really competitive person. It has served me very well, especially in business. It served me well in lots of other areas of my life too. I am fiercely competitive. For those of you who watched Friends, Monica Geller, when people try to get her to do something (like jokes) and they're like, “Think of it as a competition with yourself. Make a Thanksgiving dinner this year that just blows last year's dinner out of the water.” She gets lit up and “Yeah! I'm going to mop the floor with myself last year!” She gets all amped up and competitive over nothing. I'm much better now. I think the Monica Geller example is hilarious because it really is like my natural nature, but I have matured so much in the last few years. I'm not actively like that anymore. It's just my natural tendency to be like that. Here's an example. My social media manager is absolutely incredible. Jenny, if you're listening – Hello! Jenny and I have been working to get me the Blue Badge Verification on Facebook and Instagram. Have you guys seen that when a public figure or celebrity always has (if it's an official page), the little blue check mark verification badge on their page? Facebook owns Instagram. They have recently changed the rules and it's very weird, specific and difficult to get that. We've been trying to get that because there have been a few people who have made fake accounts trying to be me. Or claiming that something that I have created was theirs, like the Declutter Like A Mother Challenge, even though it's copyrighted. People have been doing that. It hasn't happened a crazy amount of times, but it's happened enough that, “We should probably get that Blue Badge so people can know who the original is here, who is really the one running this challenge, created this course, talking about this, hosting The Purpose Show or whatever.” We had been working on getting that Blue Badge Verification and it's been a process. I've just been sitting back and letting Jenny handle it. Recently in an email, Jenny said, “Hey, they're really having a hard time. They want you to send in this and this and this so you can get that Blue Badge; otherwise it might not happen.” I don't know what it was but, all of a sudden I got taken over by this competitive surge in myself. I started thinking, “I could think of three people who are similar to me, do similar things as me, that I know have that Blue Badge.” I got filled with this fire to conquer everything, do whatever I can to get that Blue Badge. I put aside my work tasks and I was going to get that Blue Badge. I might as well have smeared war paint under my eyes and put my fists up high and yelled, “Let’s do it!” because all of a sudden I got overcome by this competitive urge to beat everybody else and get that Blue Badge Verification on Facebook and Instagram. It was a badge of honor that I wanted to wear and I didn't like that. I saw that in myself. I'm just being super honest here, guys. It might sound silly or stupid, but this is just me being honest with an example. I had that moment where I was, “You know what? Let's take a step back. This doesn't matter. It would be nice and it would be helpful, but this is not an identity. This does not mean that I'm legit. This is definitely not my mission, my goal, or my purpose in what I'm doing in my business and in my ministry. My business is to serve you. To provide incredible value in my courses that are life changing. To provide incredible free value through the podcast twice a week. If something is going to make me focus on something other than that and take away from that, then it is not a part of my purpose. It is a distraction. That is such a pride issue and that is not how I want to live my life and run my business. So, I stepped back and I left the email there. I didn't do anything about it. I put it on my to do list for whenever I do have the time and I got back to the tasks that serve you guys. That serve my purpose. That are why I'm here. And that's because I have that “enough list.” My “enough list” when it comes to my business. says things like “it is enough to that I serve my audience, that I provide free and paid value for them that will help them and change their lives. It is enough that I do the podcast every week. It is enough that I share my heart openly and honestly and be vulnerable.” The Blue Badge of verification has nothing to do with that. That’s a silly example from the business side of things where the “enough lists” can come in handy, how they can help redirect and put you back on the ground where you belong with what really matters and is worth your time in the different areas of your life. Another example - in the homeschooling community it can be difficult to stay simplistic. A lot of people do a lot of extra things, engineering classes, all different kinds of sports and activities. I think the fact that our kids are not in school makes us feel like we have all the time in the world and we can do any activities because our kids are not away from us for six or seven hours a day and it's just a lie. We still get stretched way too thin, way over busy, and it's hard to know that boundary, know the fine line of what's too much. Looking at your “enough list” as a homeschooler - it is enough that I am doing language arts, math, history, science with my children for our school day. Anything outside of that is extra. What a mind-blowing, simple but mind-blowing, realization about is for a homeschooling mom. This is what is enough. Anything outside of this is unnecessary and extra - art classes for my daughter, guitar lessons for my son, baseball for the boys, horseback for my daughter. All those things are great and they definitely have their place. They're important for sure, but they are extra. Having a list of the bare minimum can help bring you back. If you're overwhelmed, let go of everything that isn't on that list. It can help bring clarity to your life. Look at your life. What are the areas of your life that you need an “enough list” for? I put together a free download, as usual, for you guys that you can get for this episode. Again, it's totally free and it's kind of a next step. It will help you actually do this for your own life. It will help you breakdown what are the areas of my life, what is enough in every area, and then I give examples from my own “enough lists”. I give some encouraging statements and things that you can include in your “enough list” to look at when you're feeling like you need to. I definitely encourage you to go and get that. You can just go to alliecasazza/shownotes/ bonus3. You can get that free worksheet. I would encourage you to do this. This is a super short, quick episode to say that there are things that are “enough” in every area of your life and anything outside of that is excess. It is. It can be a distraction. It can be a helpful addition. It can be great, wholesome, purposeful and helpful, but it can also be too much. I want to encourage you guys, have those “enough lists.” It doesn't necessarily mean that you're never going to do anything that's not on that list. Right now, we have a lot going on that’s not on the “enough list”. We willingly entered a little bit of a busier season right now because we know that towards the end of the year some things are going to be happening in our family that are going to make us have more home time, quiet time, less activities, and we're going to have a very quiet winter holiday season most likely. Right now, we're OK with being a little busier. We do have horseback, baseball and guitar lessons. We have chosen not to do art lessons outside of the house but to make them online. That's something that we've simplified. We're still doing the art lessons. What is the purpose in this area of my life? What's my purpose as a business owner? What am I doing here? What's enough here? What's my purpose as a mom? What is enough here? Realizing that everything outside of that is extra can empower you to say “no” or “this is all great, but I do want to do this extra thing, so I'm going to say “yes” to it, can help you make decisions and bring incredible clarity to your life. Having my “enough list” has totally changed my life and empowered me to make solid decisions. I encourage you guys to get that free download and start making “enough lists” for the different areas of your life.